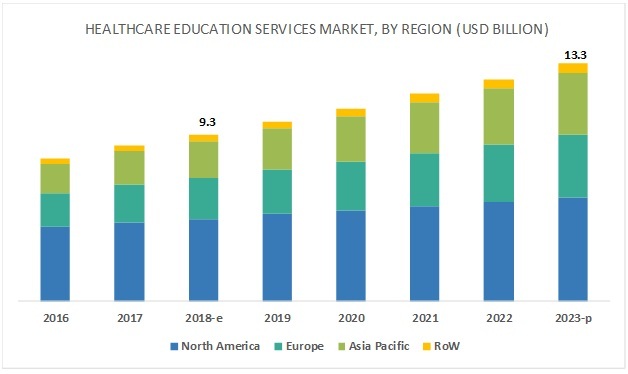 [133 Pages Report] The market for healthcare education solutions is expected to grow from USD 9.3 billion in 2018 to USD 13.3 billion by 2023, at a CAGR of 7.4% during the forecast period. 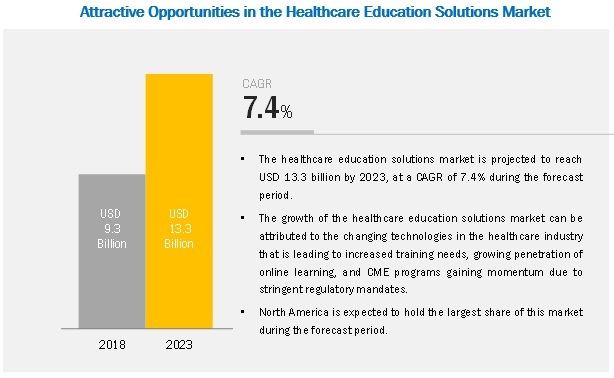 Growth in the healthcare education solutions market can be attributed to factors such as changing technologies in the healthcare industry that is leading to increased training needs, growing penetration of online learning, and CME programs gaining momentum due to stringent regulatory mandates. On the basis of delivery mode, the market has been segmented into classroom-based courses and E-learning solutions. E-learning solutions offer greater flexibility in training schedules, improved accessibility and dissemination, reduced costs, and easier access to educational material and updates. These are some of the key factors which are expected to fuel the growth of this market. Based on application, the healthcare education solutions market is segmented into cardiology, internal medicine, radiology, neurology, pediatrics, and other applications. The cardiology segment accounted for the largest share of the healthcare education solutions in 2018. The increasing rate of initiatives taken by physician associations or accredited CME providers and industry players for organizing CME activities and the growing number of grants from government bodies to help young professionals in the field of cardiology access quality training and research activities are factors expected to fuel market growth. On the basis of end users, the healthcare education solutions market has been segmented into physicians and non-physicians. The physicians segment accounted for the largest share of the market in 2018 and is also projected to register the highest CAGR during the forecast period. Government mandates across the globe for the relicensing and re-accreditation of physicians is a major driving factor for the growth of this market segment. North America is expected to dominate the healthcare education solutions market during the forecast period. Factors such as the increasing number of CME programs and an increasing number of grants and investments by public and private players are driving this regional market. The major vendors in the global healthcare education solutions market are GE Healthcare (US), Siemens Healthineers (Germany), Koninklijke Philips (Netherlands), Zimmer Biomet (US), Stryker (US), Medtronic (Ireland), Canon Medical (Japan), Johnson & Johnson (US), FUJIFILM Holding Corporation (Japan), and Olympus Corporation (Japan). In 2018, GE Healthcare introduced interactive, customizable training options enabled with the Virtual Reality (VR) technology, for healthcare technology management (HTM) professionals who service CT and MR equipment. In 2017, Medtronic (Ireland) launched ‘Medtronic Impact’ in Europe, the Middle East, and Africa. This program is intended to introduce a new approach to healthcare education and development, extending beyond traditional product and procedure training. The program is expected to enable healthcare professionals, at all levels, to grow their skills and knowledge through specially-designed learning pathways, tailored to their level of expertise. Which service segment will dominate the healthcare education solutions market in the next five years? Emerging countries have immense opportunities for the growth and adoption of healthcare education solutions, will this scenario continue in the next five years? Where will all the advancements in services offered by various companies take the industry in the mid-to-long term? What are the upcoming modes of education and training in the healthcare education solutions market? *Business Overview, Service Offered, Recent Developments, MnM View Might Not Be Captured in Case of Unlisted Companies. In the secondary research process, various secondary sources such as D&B, Bloomberg Business, and Factiva have been referred to, so as to identify and collect information for this study. These secondary sources included annual reports, press releases & investor presentations of companies, white papers, certified publications, articles by recognized authors, gold standard & silver standard websites, regulatory bodies, and databases. After arriving at the overall market size using the market size estimation processes as explained above the market was split into several segments and subsegments. In order to complete the overall market engineering process and arrive at the exact statistics of each market segment and subsegment, the data triangulation and market breakdown procedures were employed, wherever applicable. The data was triangulated by studying various factors and trends from both, the demand and supply sides, in the healthcare education solutions industry. To track and analyze competitive developments such as service launches, expansions, acquisitions, partnerships, and collaborations in the healthcare education solutions market. GE Healthcare (US), Siemens Healthineers (Germany), Koninklijke Philips (Netherlands). 10 key players covered. This research report categorizes the healthcare education solutions market based on delivery mode, application, end user, and region.